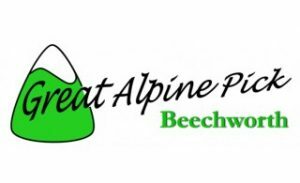 As you are all aware Mountaingrass 2018 will be held in Beechworth VIC from November 9 – 11. You are, no doubt familiar with this lovely town from The Kelly Country Pick, celebrating its 20th year this year with a week-long pre-festival music camp. It is a beautiful historic town famous for its major growth during the gold rush days of the mid-1850s, with many nearby attractions. 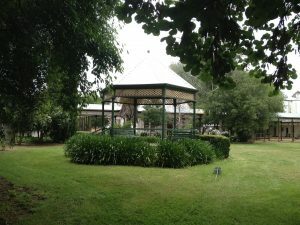 It is well serviced with accommodation, restaurants, cafes and the famous Beechworth Bakery. 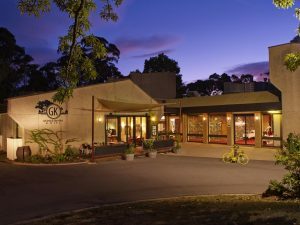 The venue for Mountaingrass 2018 is the The George Kerferd Hotel, Alberrt Road, Beechworth. It has a restaurant, bar and a large function room seating over 400. There is also a National Trust theatre available, (where Dame Nellie Melba once sang!) which is capable of seating up to 100. A small chapel in the hotel grounds, has great acoustics, is able to seat 60 and can be used for workshops and small concerts. The hotel is surrounded by acres of beautiful grounds, full of huge shady trees. The accommodation at the George Kerferd Hotel also includes the recently refurbished Linaker Lodge, previously the nurse’s quarters for the hospital that was located there. 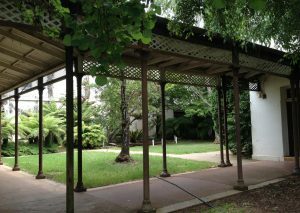 There are many open air and under-cover spaces for picking and conducting workshops.